Apple will launch on next April the 24th the famous I watch and thus in 24 different countries. The arrival of connected watches (see announcement from Apple on 2014 september), scares Switzerland. It recalls the dark days of the Swiss watch industry, which in the 70s, lost in a few months near 60000 jobs (see linked an interesting article on the consequences of the arrival of quartz watches in the Swiss watch industry). He now reigns as panic in the industry where Apple and Google announce dark hours for conventional watchmaking. Against the offensive is organized by iconic brands among the biggest groups: Some Swiss brands and others have announced the launch of connected watches: Tag Heur, Montblanc (Richemont group) etc. 2014 annual sales revenues for the Swiss watch industry = CHF 20 978 billion! Brand value 2014 source brand Finance in USD $ Millions: Apple = 104.680 , Rolex (for ex.) = 5.431, respectively ranked #1 vs #265 ! Jean Claude BIVER (President watches division LVMH) recently declared that connected watches won't compete "haute horlogerie" as never they will have the same DNA. Nevertheless, integrating within the Swiss watch industry digital technologies is not without consequences regarding the business model and the brand equity model for this industry. The key characteristics of the swiss watch industry (Facts & Figures). 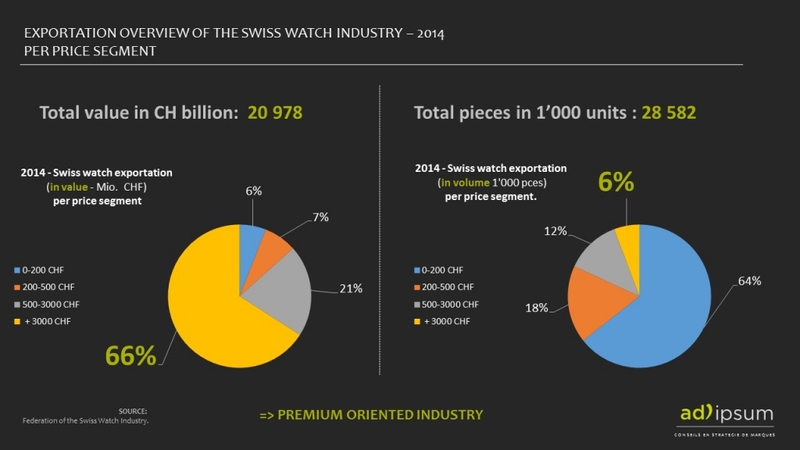 Swiss watch industry is premium prices oriented (6% of the volume represents 66% of the export sales revenues). Swiss watch industry is export oriented (95% of the production is dedicated for export). 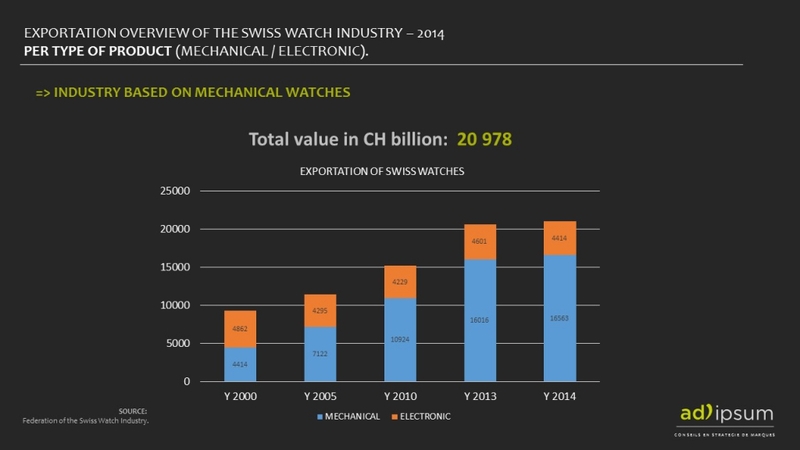 Swiss watch industry represent 2.5% (year 2012) of manufactured watches worldwide (in volume) but 54% (in value). Source: FH, VGLS. Swiss watch industry is mechanical movements oriented: According to 2014 Federation of the Swiss Watch Industry report, the breakdown of Swiss watch exportations by type of product is the following: 79% for mechanical vs 21% for electronic. 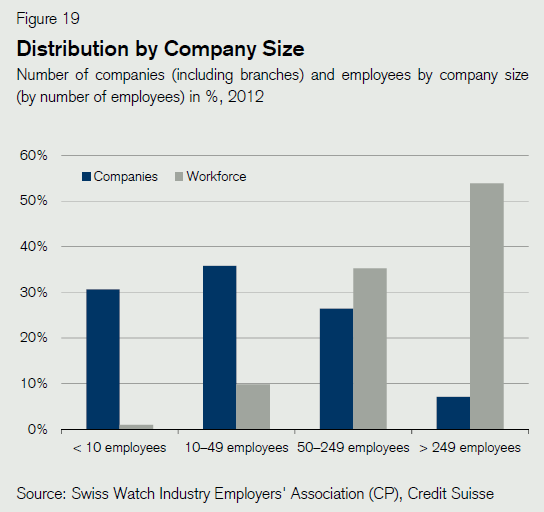 Swiss watch industry is family business oriented: In 2010, there were 596 Swiss companies working in watchmaking. Most of these companies are small businesses: 13 establishments among 600 are employing 500 or more, more than 50% of companies are employing less than 50 people! All of us are aware that brand equity for smartwatches industry is completely different to Swiss watch industry. The 2 slides below are trying to map out the two different brand equity. And it works: Google, Apple and others are ranking among the best preferred brands worldwide! We, also, love brands from the Swiss Valley as they represent in many consumers mind-sets, history, heritage, passion for details, craftsmanship, social approval, personal status, excellence and Swiss made in (see all labels like “Poinçon de Genève). The challenge regarding the arrival of the smartwatches within the swiss watch industry. 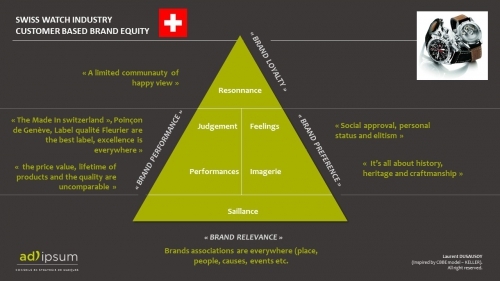 Challenge#1: Preserving the "COUNTRY OF ORIGIN", as a key element of the brand equity of the Swiss Watch Industry. Country of Origin is a driver of consumer choice. 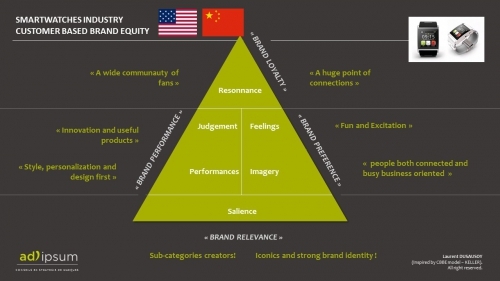 We know that “Made In” can define a brand’s tangible and intangible factors. People are now more aware of the origin of a product and the ethics used behind producing that product. As Imogen Fowler says (partner at Hogan Lovells) “Consumers expect goods to be made properly and issues such as where a product is made and whether or not it is fair trade are now more important than ever”. Futurebrand made recently a survey called “Made in report” to analyse the power of attraction and seduction of all “Made In”. Switzerland is ranked #1 worldwide for luxury goods beyond France! The reason is that the Swiss has successfully put in place specific clusters in the watch industry by integrating the majority of the elements of the value chain (components, movement assembly, design, manufacturing, marketing, wholesalers, retailers etc). While the Swiss watch industry was based on local production with local assembly, will the alliance with technologies from Silicon Valley help to keep the clusters as they are today? Is the "country brand association" (US companies +Made In USA mindset based on performances vs History) will help all Swiss labels (Poinçon de Genève, Swiss Made etc.) ?